Establishing a care routine will help you keep the ecosystem within your aquarium in balance, and the inhabitants in good health. As well as partial water changes, maintenance usually includes periodically removing algae, cleaning, caring for plants, and looking after your equipment, such as cleaning or changing the filter wool, so that it functions properly. A certain amount of algae is healthy, but it does need to be kept in check. 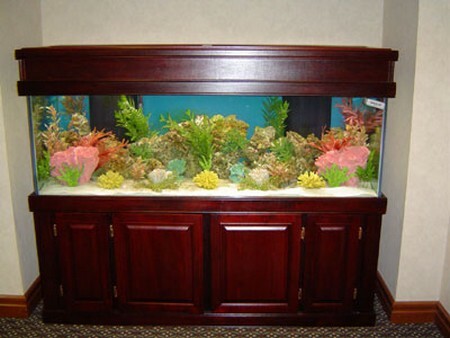 Some fish, and aquatic snails, browse on algae, but if it still starts to spread onto the sides of the tank, you may need to shorten the time that the aquarium lights are on each day. Watch for signs of algae growing on the leaves of other plants in the tank, because it threatens their growth by blocking the pores here. Some plants are more susceptible than others, with the fine net-like leaves of the Madagascar lace plant (Aponogeton madagascariensis) especially vulnerable to colonization by algae. This ultimately makes the leaves rot, killing the plant. There are magnetic or long-handled scrapers which you can use to clean off excess algae. Take extra care with an acrylic tank or you may scratch it. Aside from being unsightly, these scratches may then also be invaded by algae, creating green streaks that are almost impossible to remove without emptying the tank and scrubbing the affected areas. If you spot algae in the airlift or a similar site, then use a small bottle brush to clear the tubing. While green algae predominate where there is too much light, you may find brownish growth in a tank that is underlit, especially if has no living plants. This is usually most seen on rockwork; remove the rock and clean off the algae with a scrubbing brush and water. 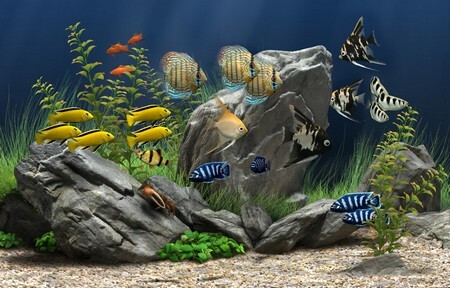 Overall cleanliness within the aquarium will be helped by sloping the substrate slightly; with the movement of the fish, mulm that is not drawn up into the filter will collect at the front of the tank, and can be siphoned out. Using a gravel cleaner is particularly important with catfish; if the substrate becomes dirty, their barbels may become infected or develop body ulcers where they rest in contact with the bottom. Certain bottom-dwelling species of catfish may also aggravate the problem of excess algae and harm plants. These fish tend to stir up any mulm in the substrate, which resettles on the plants’ leaves, again blocking the pores, and encouraging algal growth on the plants. It is very common for plants, however lush they may appear at first, to fail to some extent soon after being moved to a new aquarium. Do not be tempted to discard them because, assuming that the conditions are generally favourable for them in terms of water and light, they should start to rejuvenate and grow well. As well as light and nitrate, the plants also need a range of minerals and trace elements for their well-being. For example, iron deficiency tends to turn the leaves white before the plant stops growing. This is especially common with Echinodorus species, as well as certain types of Vallisneria. Plants need iron to make chlorophyll, used in photosynthesis, so you may have to provide a specific fertilizer that contains it. Partial water changes are important for plants as well as for the fish, helping to ensure that key trace elements found in tap water are regularly replaced. Should the air supply become impaired, check first that the tubing is not kinked or squashed. If you notice the air pump becoming noisier, have it serviced, although you will need a replacement to keep the system running while it is being checked. Make sure that the air pump is never covered, because this could start a fire. If you have a box, sponge, or canister filter with a core containing a filter medium, you will have to maintain the filter wool in good condition, so that it does not impede the flow of water. How often you need to do this varies, depending on the strain imposed on the filter by the volume and condition of the water. Bacteria – The existing filter wool will include an established colony of beneficial bacteria, so in general it is better to wash it, rather than replace it, otherwise filtration will be poor until new bacteria establish. Washing filter wool – Do not use fresh tap water since it contains chlorine, which acts as a disinfectant, killing the bacteria. Instead, use some of the old water siphoned out of the tank, squeezing the wool or sponge to remove the dirt. Replace the wool and reassemble the filter. Changing filter wool – After a time, the filter wool will start to deteriorate and should be changed; it is best to replace it gradually, removing some of the old wool and adding a new portion alongside. This minimizes the effects on the bacterial population, although you may also add a bacterial culture at this stage, to speed up the maturation of the new filter. Peat filter • Peat used in a filter needs to be changed regularly. In a new tank especially, it is wise to switch.